A couple of firsts that I am very excited about to share with you all! Firstly, over at Reading the Past, Sarah has the first picture I have seen of the cover for Sharon Kay Penman's next book, The Devil's Brood, which is due out in October! The second first is the first review I have seen of the new book by Carlos Ruiz Zafon which has appeared over at Omnivoracious. The book is only out in Spanish at this time, but the review definitely sounds promise. This is one book that I will definitely be buying when it finally is released in English! 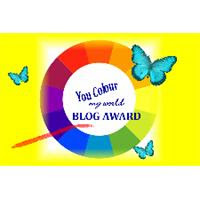 The third first is that I have been awarded a "You Colour my World" blog award from The Colour Jane. Thanks! I hope it won't be too long before Carlos Ruiz Zafon book comes out in English. I really enjoyed his other book. Hey - great award *wink* - but seriously can you give me the name of the Sharon Penman Henry/Elenor series that the final book is coming from soon..thats bad English I am sure but you know what I mean..
just re watched The Lion in Winter with Katherine Hepburn and Peter O'Toole playing this giants of history. The first book is When Christ and His Saints Slept and the second book is Time and Chance. Kathy, from what I can tell around the place, the Ruiz Zafon book will be out this time next year in English.